ehume wrote: More on polarization. In this article (https://learn.zoner.com/add-pizazz-to-y ... andscapes/), we have this image: https://learn.zoner.com/wp-content/uplo ... /color.png. Seems to me Corel should be able to replicate that function. 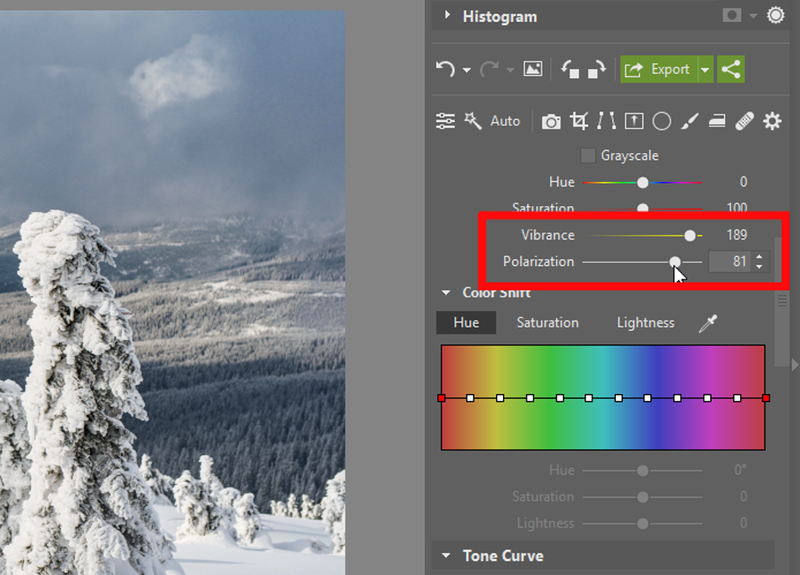 Try Adjust > Color > Fade Correction folowed by Adjust > Hue and Saturation > Vibrancy with different combinations you actually get whiter snow. To Admin sorry for helping fill up this thread with answers to questions that should have been tested in the general forum with a separate question before filling up space here. Might be better to move the question and my answer to a separate post so others may answer to it as well. This Wish list thread is already 5 pages long and perhaps should only be about 2-3 pages giving Corel reps less garbage to wade through to find realistic wishes when so much is already present but has not been found by the users. eg another posting that wishes for being able to set the foreground or background transparent . This already exists and if the original posted had asked in a separate post would have found the answer and not needed to post in a wish list. The answer being to click the third Transparent button under both the Foreground and Stroke Properties and Back ground and Fill properties boxes. Last edited by Kathy_9 on Sat Jan 12, 2019 10:12 pm, edited 1 time in total. Reason: Moved from Wish List thread for further discussion if warranted. The point about polarization was to show an image of a polarization slider. Had PS3, PSP3; Installed: PSP-4.12, 5.03, 6.02, 7.04 (liked it a lot & used it for years), 8.10, 9.01, 10, 11, x4, x6, x7, x8, x9; now using PSPx10 (PSP 2018; version 20.2.0.1 x64) on Win 10-64; rejected PSP 2019. The Nik ColorEfex Pro 3 was available in earlier versions as a plugin and now the updated one Color Efex pro 4 was available as plug ins when Google released the full set for free download before another company picked it up. Yeah I have heard that some people had problems with it running once the other company bought the rights. But are those rights retrospective? Wonder if trying to install the Google free package will call home and be diverted to the new company and so deny the installation. The Nik color Efex Pro 3 was provided free by Corel with PSP X5 as part of the Ultimate package. Now the new owner has made a deal with Google after the free distribution and removed it from free distribution and now charges US69.90. EDIT If you do a Google search you can still find the free version around . Thanks, hartpaul, for pointing out the Coloreffects plugin. The slider works perfectly! It still seems to me that Corel could include such an old effect in their main PSP implementation. As for the Nik collection, it seems strange that distributions are only available at a price. IIRC, Google put the collection in the Public Domain. I may be misremembering it, however. Maybe Google retained their copyright and allowed free distribution. Whatever, I'm glad to have it. hartpaul wrote: Yeah I have heard that some people had problems with it running once the other company bought the rights. But are those rights retrospective? If that is, indeed, the issue, the workaround is to simply use your firewall option to stop all internet activity prior to doing the installation, then install the free version, then use your firewall option to deny internet access in or out for the collection, then restore internet activity. FWIW, I have certainly installed my old (free) version of the Nik collection on a computer since the new company took it over, and it installed and operates without the slightest problem. DxO was originally linking to Google's old free version alongside their paid version. You were paying for the updates but old collection 3 was still free. I don't know what the allowances are to share. But I don't remember having to register it so I don't think it would have any way to confirm your being allowed to have it.